I paused this afternoon to consider my bookcase. One of several bookcases actually. The one at home with novels, history books and stuff other than textiles books. I have three groaning shelves in the studio with my fashion / textiles books and another at home with textile history and other art history books. And behind the sofa is this one. 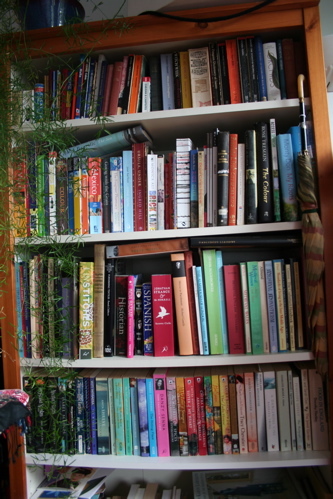 A friend was perusing my the other day, which is always a strange thing – a person’s bookshelf says so much about them, is public yet is intensely personal. I was asked to join some book-discussion-sharing website thing the other week – which I haven’t – sorry Heather. I don’t have time to read much at the moment, and would have even less if I tried to blog about it as well! Plus I can’t afford to being buying new books, let alone finding space for them. I considered the new Harry Potter as a gift but I declined due to lack of space (though I will happily borrow a copy). So what is it on my shelves which allows no more space? I have got quite a lots of books compared to most people, but really, a few hundred books isn’t anything out of the ordinary as far as I am concerned. I grew up in a family with more books than wall space. More books than anything. I did have space on these shelves when I moved in, 10 months ago. Having moved house many many times over the last 14 years, I have shed quite a lot of novels and have limited what I keep to things I really loved. So anyway, I’m not really answering the question about what is on the shelves, so unless you can read the spines in the pictures, it will remain a mystery. It’s more of a question for myself about what I have and am not reading. And doing something about it. And considering how nice they look on the shelves. 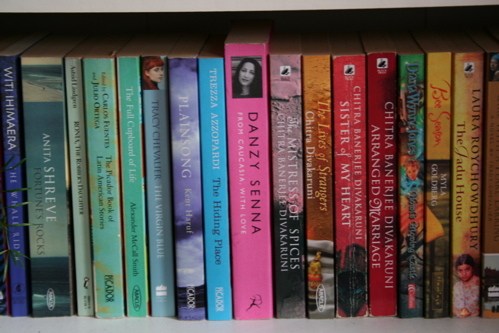 Yes I did arrange this shelf of paperbacks by colour. One final note, I am reading, and have been reading for ages Jewels, A Secret History by Victoria Findlay, author of one of my favourite books – Colour. I’m not putting in an Amazon link – if you want it, google it and order it from a local independent book shop!